With the trend to large ceramic and stone tiles, costing up to $100 each, mistakes in cutting them to size can prove costly. 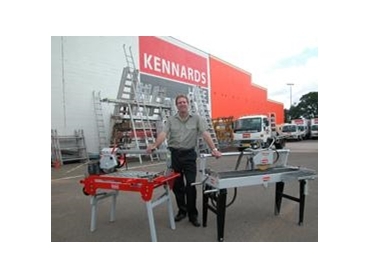 Two high-precision saws, which are available from Kennards Hire are designed to overcome the problem. The high-precision saws are suitable for both inside and outside work, cutting everything from ceramic, including porcelain, to stone such as granite, marble and slate. The larger model cuts tiles up to 670mm square, with a diagonal cut of up to 950mm, while the smaller model is used mainly for ceramic tiles up to 550mm square. According to Kennards Hire, the saws were accurate, cut sharp edges, bevel edges up to 45 degrees and had a lot of bench space. The saw moves along a guide rail, rather than the operator having to move the tile. A water recycling system avoids mess around where the tiles are being cut. The high-precision saws’ fold-up legs and wheels, which were designed exclusively for Kennards Hire, made for easy transporting and movement on site.